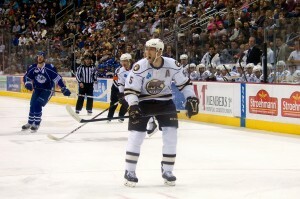 HERSHEY – A match-up against the Manchester Monarchs (23-9-2-4) provided the Hershey Bears (15-12-3-3) a measuring stick for their roster in their third game of 2014. They passed a big test with a convincing victory over the L.A. Kings’ AHL affiliate, stemmed from a four goal rally to put the game out of the Monarchs’ grasp as the game wore on. Hershey increased their point streak to four straight games (3-0-1-0) and picked up five out of a possible six points in their first three games in three nights stretch of January. Six different forwards scored for the Bears and Matt Watkins, Ryan Potulny and John Mitchell were the only forwards that didn’t record a point. Haviland stated it was the best weekend the Bears have had in the 2012-13 campaign. Paced by Brandon Segal, who totaled one goal and three assists, Hershey topped the top team in the Eastern Conference in a 6-3 high scoring affair. The Bears’ power play totaled half of Hershey’s offensive output, finishing 3/5 on the man advantage. It was the second night in a row Hershey tallied three power play markers. Segal has seven points in his last two games and leads the club with 24 points in 28 games. Hershey jumped out to a 2-0 lead with goals from rookie forward Dustin Gazley (power play) and Peter LeBlanc. Gazley earned his first points with the Bears this season after his call up from the ECHL’s Reading Royals. He assisted on LeBlanc’s first period marker just 1:09 after he opened the scoring 12:33 into the game. Gazley totaled nine points in 29 games for the Binghamton Senators last season. Defenseman Andrew Campbell and forward Nick Shore immediately answered Hershey’s two goal advantage with goals just 1:58 apart to knot the game at two. From that moment on, the Bears dominated puck possession and tilted the ice decisively. Nick Deslauriers added Manchester’s third goal of the game in the final minute of regulation. Bears with AHL lead for most number of players on the roster with at least one goal (26), with Dustin Gazley's first period PPG. Bears goaltender David Leggio (10-10-2) earned his third consecutive win in net, recording 32 saves on 35 shots. Casey Wellman (power play), Ryan Stoa (power play), and Nicolas Deschamps (shorthanded) also scored for Hershey. With Deschamps’ goal on the penalty kill, the Chocolate and White collected shorthanded goals for the second straight game after Matt Watkins netted an empty net marker on the penalty kill Saturday night. The Bears travel to Binghamton Friday night for another contest against the Senators. They return home on Saturday for a matchup against the Springfield Falcons, also the return of longtime Hershey defenseman Patrick McNeill.